Dana Norland shoots two men in cold blood and flees the US for the mountains of Rwanda. Posing as a biologist, she finds herself caring for gorillas with Kristen, Dian Fossey's successor at the Karisoke research center. She has plenty of time to think about what she's done, but can she find peace? 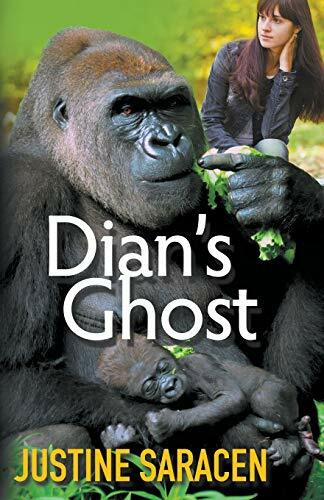 Apparently not, for the mountain is haunted both by the ghost of Dian Fossey, and by the men who murdered her. Personal vendetta joins with genocide, and to flee the marauding butchers, the women hide in the rainforest. Among the mountain gorillas they once protected, they learn what justice is. And what it is not. transgendered novel Sarah, Son of God followed, taking us through Stonewall-rioting New York, Venice under the Inquisition, and Nero's Rome. The novel won the Rainbow First Prize for Best Transgendered Novel. Beloved Gomorrah marked a return to her critique of Bible myths--in this case an LGBT version of Sodom and Gomorrah--though it also involved a Red Sea diving and the hazards of falling for a Hollywood actress. Having lived in Germany and taught German history, Justine was well placed to write her three previous World War II novels: Mephisto Aria, (EPIC Awards finalist, Two Rainbow awards, 2011 Golden Crow n first prize) Tyger, Tyger, Burning Bright, which follow s the lives of four homosexuals during the Third Reich (2012 Rainbow First Prize), and Waiting for the Violins, a tale of the French and Belgian Resistance, which just appeared. Her work in progress, provisionally titled, The Executioners, tells of two women who take revenge for those who cannot. An adopted European, Saracen lives on a charming little winding street in Brussels, venturing out only to bookfests in the US and UK, and to scuba adventures in Egypt. When she's home and dry, she listens to opera.